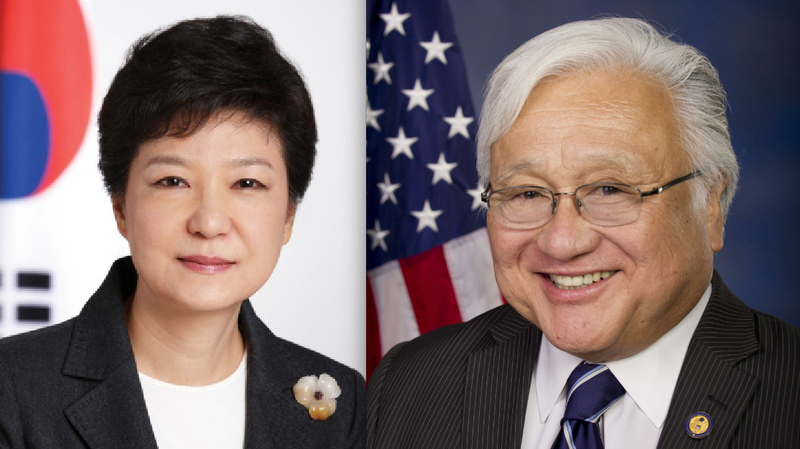 SAN JOSE — Rep. Mike Honda (D-San Jose) and South Korean President Park Geun-hye met in Seoul on Dec. 19 to discuss enhancing the economic, cultural, and security partnership between Silicon Valley and Korea. The discussion was part of a five-day trip by the congressman to meet with business and government leaders in Korea and enhance the relationship between the two regions. During the 30 minute, one-on-one meeting, the two also discussed the path for reunification of the Korean Peninsula and Korea’s pan-Asian relations, including those with Japan. Park and Honda agreed that the first step to reunification is increased family visits between North and South Korea. On this trip, the congressman delivered a keynote policy address at the Asan Institute. He also met with Foreign Minister Yun Byung-se; the Korean International Trade Association (KITA); the Presidential Committee for Unification Preparation; the American Chamber of Commerce-Korea; SK T.um, a large Korean telecom provider with a significant Silicon Valley presence; U.S. Ambassador Mark Lippert; the Northeast Asian History Foundation; and the Ministry of Trade, Industry, and Energy. Also on the itinerary were a visit to the War Memorial of Korea, a meeting with U.S. troops stationed at Yongsan Garrison, and a visit to a House of Sharing, where surviving comfort women live.